The inauguration of Jair Bolsonaro marks a watershed moment for Latin America, perhaps for the world. It is an important step forward towards the consolidation of a destructive axis, well beyond Erdogan and Donald Trump. The Asia of Duterte, the Middle East under the leadership of the Saudis, the Europe of Orban and Salvini. It is spreading like a wildfire in summer. With the elected government, the most powerful country in Latin America embraces a political agenda that is accelerating the destruction of the planet, destroying the hard-build multilateral consensus, undermining international institutions, dismantling major advances in the area of economic, social and cultural rights, triggering military spending and accelerating aggressive, fast-tracked privatizations at the expense of the people. It is using the State itself to neutralize and even destroy the opposition. First: Elevate the profiles of newly elected progressives. The Brazilian Congress and Senate is welcoming for the first time a new generation of political leaders, especially black women, and the World needs to know more about them and their remarkable efforts to democratise a traditionally exclusive and now alarmingly threatening political arena. It is important to have internationally recognized voices that can legitimately raise the voice of alarm and denounce the abuses of the new Government. We can support their teams and coordinate their agendas with the European Parliament, establish links with the newly elected progressive Democrats in the US Congress and Senate. Help them get interviews and profiles in international media, so they can be recognisable and voice their concerns when necessary. We can also activate our own support network to amplify their voices. Second: Progressive Cities and local Governments as spaces of resistance. It is important to reinforce the role of local governments as spaces for political renewal, innovation and protection of the vulnerable, in the face of extreme austerity measures and escalations of governmental violence. Do not forget that some cities in Brazil are larger than some European nations. 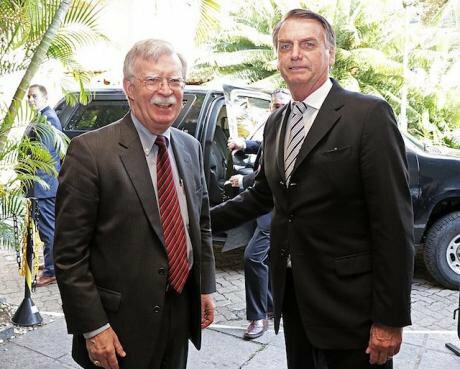 Soon we should connect progressive Brazilian local governments with international networks that are fighting against the 'nationalist international' agenda. The next round of local elections in Brazil will take place in 2020. It is a golden opportunity to shift power back to democratic forces, producing an effect similar to the midterms of the United States. It is also a real opportunity for political renewal for the parties. There is time to cultivate and grow a whole new generation of candidates for young municipal councillors, with the potential and driving force to restore hope and trust in progressive politics. Third: Shielding the opposition, critical academics, journalists and the intellectuals. While we should continue tirelessly advocating for Lula's freedom, arbitrarily detained, he is not the only one under threat. There are several targets for the Bolsonaro administration, including, but not limited to, the landless movement activists or the Workers Party (PT). Those under threat include each and every person whose voice or even views represent a threat to the elected government and its anti-rights agenda. The attempts of lawfare will continue and the Congress will continue its efforts to criminalise the opposition, with anti-terrorist laws, with direct and announced threats to freedom of expression and academic freedom, closure of entire institutions, massive dismissals, budget cuts, weaponisation of justice and imminent exile for many. Political violence and impunity will also continue. The extrajudicial execution of Marielle Franco is still unsolved, almost a year after her brutal murder, in spite of all the advocacy and press coverage that political crime deserved. Peasants are being murdered, indigenous and landless communities are under threat of violent evictions from their homes. The vigilantism and attempts to relax firearms laws, encouraging its use non 'legitimate defence', combined with hate speech, will only worsen the scenario. We must test our real commitment and offer our institutions as a refuge to those who might be forced to leave Brazil. As internationalists, we must be prepared for a form of solidarity that transcends the letter of support, gathering signatures from the usual suspects. We must test our real commitment and offer our institutions as a refuge to those who might be forced to leave Brazil. A chain of concrete solidarity gestures could offer a cushion for those facing political persecution. From our modest guest room or sofa to scholarships, research spaces and research residences for Brazilians. We need to offer them the possibility to continue the resistance from exile, without risking prison or their lives. Fourth: International Watchdogs of Bolsonaro´s policies and their effects on the economy and society. The newly elected administration should face strict scrutiny from researchers, journalists and think tanks. Key areas to observe are military purchases and cooperation agreements, privatizations, megaprojects and policies to offer tax benefits. Producing data to counter attempts to normalize the aggressive economic policies that the new President of Brazil will impose on the poor are much needed. It is highly likely that the establishment press will try to normalise Bolsonaro if the beneficiaries of his policies are large corporations and global financial groups, the 1%. Another area to monitor and measure will be austerity measures, cuts to crucial budgets, such as environmental, research and development, and reproductive health and the potentially harmful long-term effects. Fifth: Zero Tolerance to regressive policies undermining human rights. The Administration of Donald Trump is welcoming Jair with open arms, along with the 'nationalist international' in full. The possible immediate counterweight, considering the weakness of progressive forces in Latin America, is Europe. Europe must play a crucial role in counterbalancing and holding the new administration accountable in Brazil, be willing to sanction without hesitation if it embraces fascist policies and practices. We need a combination of intellectual and journalistic commitment against the advance of fascism, strict citizen scrutiny, international observation, solidarity and unity. Likewise, Latin American civil society needs to play a crucial role in preventing the countries of the region from following Bolsonarismo's tide. The local and global stakes are too high, from abandoning the Palestine struggle for liberation to possible military intervention in Venezuela. While his capacities are limited, Bolsonaro ambitions to play a role as Latin American leader. He can be tricked into a useful idiot role and unleash a military intervention that no one had dared to, with terrible consequences and only one beneficiary, certainly not him. That is why I am launching a broad call of action and suggesting some starting points. A combination of intellectual and journalistic commitment against the advance of fascism, strict citizen scrutiny, international observation, solidarity and unity can show that those of us who believe in democracy and human rights are more.